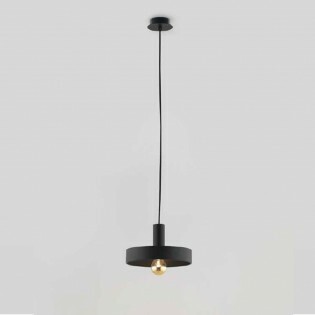 Abad it is a Industrial style pendant light, with an avant-garde design. 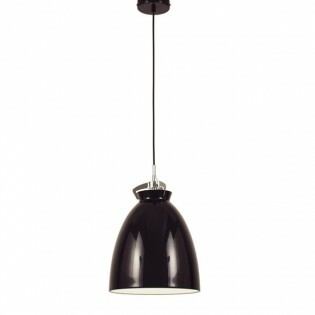 Made of metal and finished in the shape of a clamp that holds a metal lampshade, finished in glossy black. Sobriety and elegance in a perfect lamp for living rooms, restaurants or dining rooms in a modern industrial style. Dimensions: Height regulable 150 cm. Diameter 29 cm..
Ceiling light Abad made of metal, finished in chrome and composed of large elongated lampshade. Design by Jana Chang perfect for lighting all types of rooms: kitchens, living rooms, dining rooms... Metal available in black or white. Please consult us for more information.Dimensions: Height 150 cm. Diameter 29 cm. 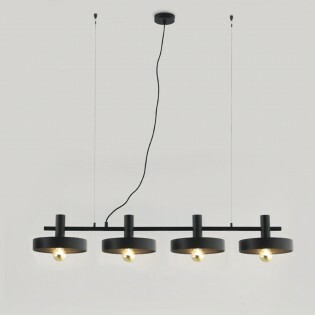 Ceiling light Aloa by the designerr Fornasevi made of metal with a black finish. Lighting with E27 bulb (not included). Ideal style for lighting rooms to the latest trend. Two such lamps in the kitchen or dining room will be ideal.Lampshade available in gold and chrome. Please consult us for more information.Dimensions: Height 14.7 cm. Diameter 25 cm. 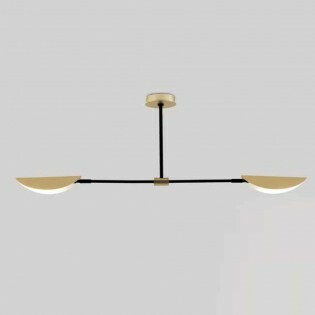 Ceiling light Aloa modern style ideal for lighting your kitchen, dining room....Metal structure in black with four lighting points available, interior diffuser in gold color.Diffuser available in chrome. Please consult us for more information.lampshade dimensions: Height 14.7 cm. Length 110 cm. Pendant light Cohen+ vintage style of big dimensions made of metal with chrome finish, fastened to the ceiling by means of screwed tubes and movable arms. You can adjust the height as you wish to adapt it to your space.Dimensions: Height 56 - 200 cm. Length 189 cm. Ceiling Lamp collection Crane designed by Jf Sevilla. 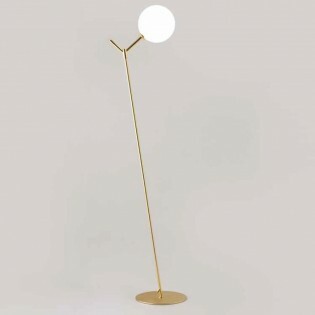 Fantastic lamp with two small spheres at the end of its metal bar integrated with LED lighting, 3 W each and conical light point at the other end. It will bring a vintage and elegant touch to your dining room, living room or bedroom. Dimensions: Height 150 cm. Ceiling lamp from the Damo collection. Made of metal with a matt gold, black or copper finish. The lower part has a glass diffuser to create a different lighting effect. Its design is simple but modern being ideal for lighting kitchens, living rooms, dining rooms and bedrooms. Dimensions: Height 150 cm. Diameter 40 cm. 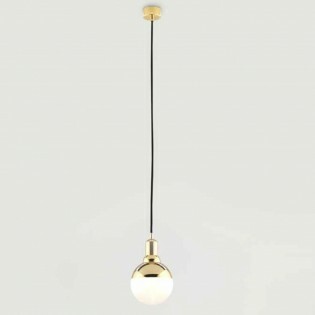 Ceiling light Disc 2 designed by JF Sevilla made of lampshade in the form of a plate made of metal, available in gold and in three different sizes. Dimensions:- Small:Height 150 cm. Diameter 15 cm.- Medium: Height 150 cm. Diameter 25 cm.- Big: Height 150 cm. Diameter 35 cm.Available in white, black and chrome. Please consult us for more information. 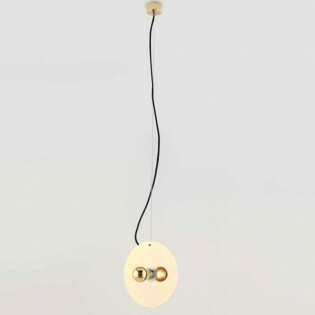 Dodo it is a Pendant light in a modern style, with an avant-garde design with a retro-vintage feel. Made of metal finished in glossy white. Perfect for lighting modern or retro-vintage living rooms, as well as restaurants and commercial premises. Dimensions: Height regulable (48 - 150 cm). Diameter: 18 cm. Ceiling light Ellen with spectacular design made of black metal made up of structures of different shapes. Its retro-vintage style is perfect for dining rooms, living rooms, bedrooms.... Other finishes available: white, gold or chrome. Please consult us for more information.Dimensions: Height 150 cm. Ceiling light from the collection Fest designed by JF Sevilla. It is made of metal with six points of lighting in the shape of a plate. Each in a different finish: amber, dark blue and turquoise. The wire is black.Dimensions: Height 200 cm. Diameter 15 cm. 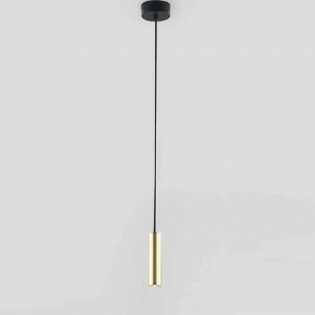 Ceiling light Hito with six light points, metal lamp holder in gold finish and black hanging structure. Ideal for placing decorative light bulbs and give a vintage touch to your home: in dining rooms, living rooms, bedrooms...Dimensions: Height 25 cm. Diameter 21.5 cm. Ceiling light with lighting LED integrated (3W) and non-replaceable. very fine metal lampshade finished in matt gold. Ideal for lighting your home with a retro-vintage touch.Overall dimensions: Height 200 cm.lampshade dimensions: Height 18 cm. Diameter 4.5 cm (Ver dimensiones en a imagen). Ceiling light Mika modern and minimalist style, made of metal and finished in copper. Comes integrated with 1 W LED lights (replaceable). An ideal decorative light for bedrooms, living rooms, kitchens, dining rooms etc.Dimensions: Height 300 cm. Diameter 2.5 cm. Ceiling light vintage style consisting of eight fine-grained, light-integrated, copper-finished metal tubes LED of one watt. Perfect technology for minimum consumption. Adjust the height as needed and place the lamp in your dining room, living room, bedroom... Overall dimensions: Height 70 - 300 cm.lampshade dimensions: Height 45 cm. Diameter 65 cm. 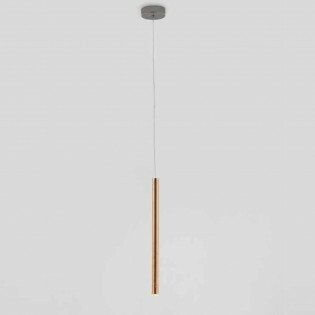 Modern ceiling light Post . Made of metal available in two finishes and with spherical opal glass lampshade. It has a cable of great length, so that you can adjust it to the measurement that you wish. Its minimalist and stylized aesthetics can fit in rooms such as your living room, dining room or bedroom. Dimensions: Max. height 300 cm. Diameter 10 cm. Ceiling light from the collection Luca. 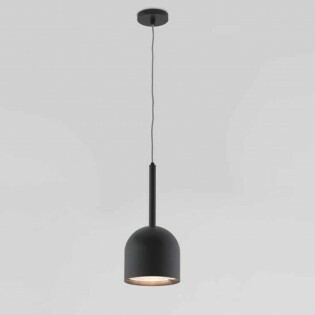 Structure made of metal with matt black finish and lampshade with cylindrical design. Very typical lamp for restaurants or other businesses. Ideal for home stays such as the kitchen, living room etc.Dimensions: Height 150 cm. Diameter 20.5 cm. Ceiling light from the collection Open with large size lampshade made of white fabric. Ideal for modern and modern style decorations: in dining rooms, living rooms, bedrooms...Other finishes available: grey and black. Please consult us for more information.Dimensions: Height 150 cm. Diameter 50 cm. 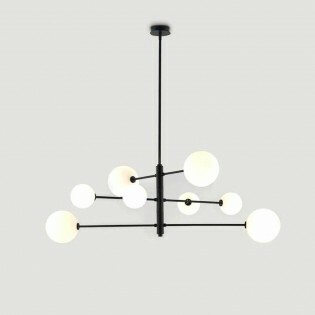 Ceiling light Rendo (six lights). A design by Fornasevi made up of several black metal tubes placed at different heights and positions. Lampholders in matt gold. Ideal for placing decorative light bulbs and give a vintage touch to your home.Overall dimensions: Height 150 cm. Length 48.7 - 150 cm.Dimensions of the canopy: Diameter 12.7 cm. Pendant light from the collection Snowflake with beautiful transparent glass lampshade and metal frame with chrome finish. Ideal for all types of rooms: dining rooms, lounges...Available in gold finish. Please ask us for more information.Dimensions: Height 300 cm. Diameter 17.8 cm. 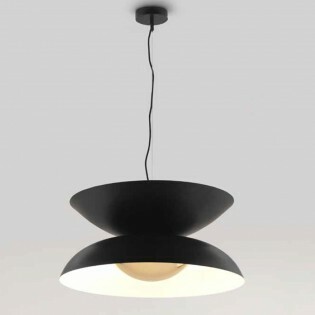 Ceiling light Yoyo modern with oval shapes overlapping each other made of black metal (inside in white). Interior diffuser in matt gold. Ideal for lighting rooms such as bedrooms, living rooms...lampshade dimensions: Height 25 cm. Diameter 56 cm. 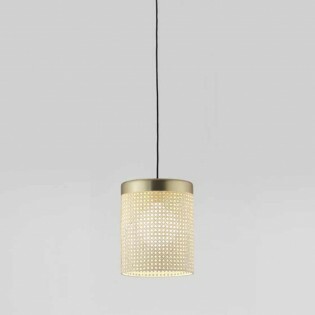 Sophisticated Ceiling light with a modern retro look. With an original design imitating white opal balls held by a support at different heights. 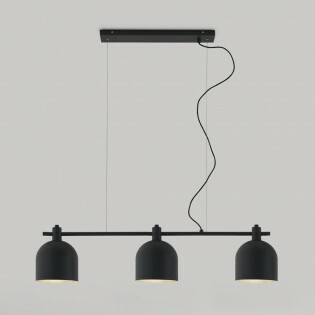 Lamp with 6 lights combined in black with matt gold or copper. Eye-catching lamp for living rooms, bedrooms, commercial premises, shops, bars, etc. Dimensions: Height 85 cm. Diameter 80 cm. Divertida Ceiling light with a modern retro look. 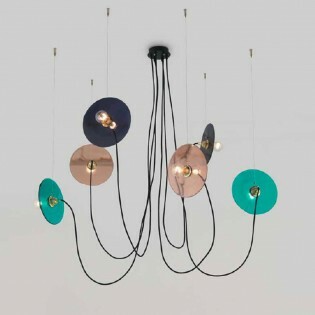 With 6 lamp holders distributed in a circular shape by means of metal bars finished in matt gold or matt black and decorative caps. Ideal for decorative light bulbs. Striking lamp for living rooms, bedrooms, commercial premises, shops, bars, etc. Dimensions: Height 60-200 cm. Diameter 70 cm. Desk lamp of minimalist design, with metallic structure finished in chrome or gold (both finishes available), folding arm and hinge in the upper part to direct the lighting to where you need. 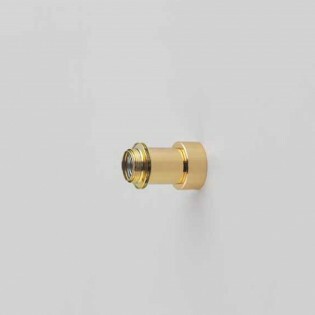 Ideal for lighting modern style rooms, such as the bedroom or office table.For more information of the gold finish, contact us.Dimensions: Height 40 cm. Length 42 cm. Floor Lamp Ario Modern design, very nice, made of metal with a black finish and cotton lampshade. Ideal for dining rooms, living rooms, bedrooms...Dimensions: Height 150 cm. Diameter 20 cm. Floor lamp with lampshade available in opal glass and structure in matt or matt black brass (consult us for more information on this finish). The dial offers the distinctive touch in the way it projects light, it does so gently and with a touch that your living room or dining room will appreciate. Dimensions: Height 125 cm. Diameter 40 cm.